Our fast selling Siberian Eleuthero line has now been expanded to include convenient, affordable and potent extract vials. Each bottle contains 4000mg of Siberian Eleuthero Root (formerly known as Siberian Ginseng) in an alcohol-free extract with honey and water. Siberian Eleuthero(Ginseng) has been utilized by millions over many years to enhance energy and bolster stamina. Athletes and active people, as well as other individuals looking to experience increased levels of vitality, have benefited from its use with great results. 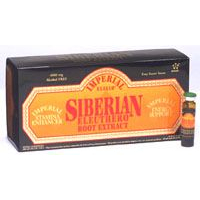 Ingredients: Extract of Siberian Eleuthero (Eleutherococcus senticosus) root, distilled water and honey. Contents: Each 10ml (0.34oz) bottle contains 4000mg of Siberian Eleuthero root. Minimum Eleutheroside ( B and E) content of 0.80%.